How to edit DVD movies with best Mac DVD to MP4 converter? Many friends like DVD movies, for it has superior ability to reproduce moving pictures and sound, superior durability, and interactivity. Beautiful pictures, clear sounds and high qualities has become its main features. However, nowadays, increasingly younger customers are watching on the little screen, on the mobile device and on the laptop, rather than the relatively big-screen TV. Sometimes we want to edit the favorite movies and customize them for ourselves. And then, how to edit DVD movies and transfer them into our portable device and look them on our little screen anywhere and anytime we like? 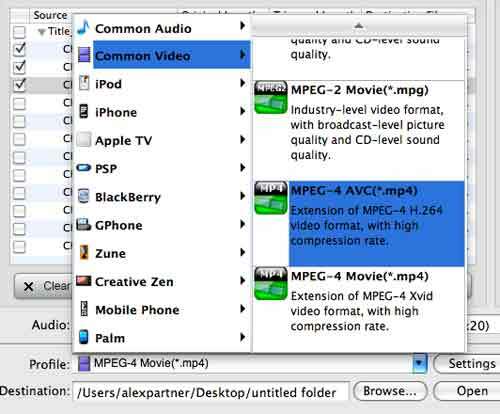 DVD to MP4 converter for Mac comes to help. 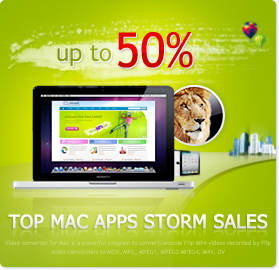 As best DVD movie editing software, DVD to MP4 converter for Mac is a professional tool to convert DVD to MP4 on Mac. On one hand, you can edit DVD movies, for example, to trim, crop, rotate and join videos, and transfer your favorite DVD movies to many portable device like iPhone, iPod, Blackberry, PSP, Creative Zen, Apple TV, 3G phone, Gphone. Palm, iRiver etc; On the other hand, you can easily rip movies from both home DVDs and commercial DVDs. And you can easily convert DVD to mpeg 4, h.264 and other video and audio formats. As a music lover, you can also extract DVD audio with this magical DVD to MP4 converter for Mac and save it as mp3, aac, flac, amr, wma, amr, wav, aiff, mka, m4a etc. If you like the pictures in the movie, you can take some snapshot in the preview window. 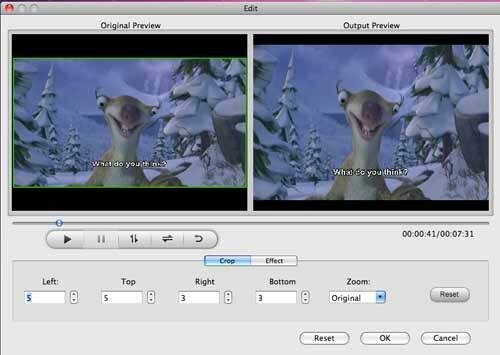 Do you know how to edit DVD videos with this best Mac DVD to mp4 converter? The tutorial tells you step by step. Before we start, please download DVD to MP4 converter for Mac and install it on your computer. Step 2. This is the most key step. 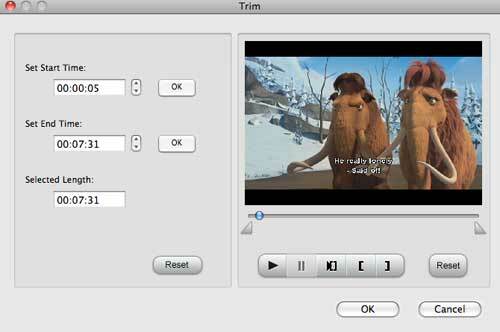 Customize your own movie files and edit them according to your own need. Firstly, click Chapter/Title, Select all and Deselect all to choose which chapter you'd like to convert. You can also select the whole disc to convert. We take first three chapters for example. Secondly, click Trim icon, you can trim the DVD movies to a length you like. Just drag the two triangles and the preview window will show you the effect. Click OK at last to save your settings. Thirdly, click the Edit icon to edit the DVD video. You can crop out the part that you don’t like, and create best movie effects by setting video brightness, contrast, saturation, and applying a special video effect. You can compare the effects through two preview windows. Click OK to save your settings. Step 3. Click the triangle before Settings icon, you can choose any formats you need, so that it will be accepted well by your digital device. You can choose common video, and any formats that suit for your iPod, iPhone, Apple TV, PSP, BlackBerry etc. 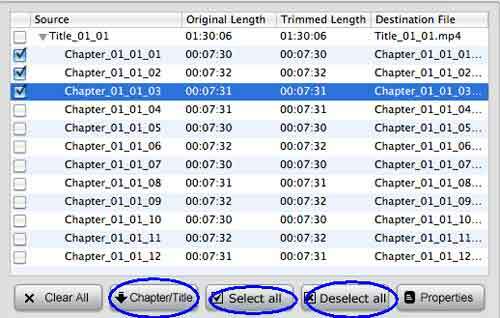 If you convert several chapters at one time, you can choose Merge into one file choice, and convert them into one file. Step 4, click Open to choose the output destination for your output movies. Click the Convert icon to start conversion. When it's finished, you'll get an alert. You can get the output video and then transfer it to your portable device. Just enjoy your favorite video movies and share them with your friends now. Come on, just download best DVD to MP4 converter for Mac and make your own movies.